The Center for Integrated Access Networks (CIAN) here at the University of Arizona had us enrolled in many wonderful opportunities to further our education including workshops and a preparation course for the GRE during this first IOU-NA program. All of which I am finding extremely useful because they are incentives to further our education but not obligations to do so. Though these activities at first can seem overwhelming they help to ensure I stay busy with research and ahead of the curve in my academic work. Striving for excellence begins with the will to motivate the self but does not end there. The CIAN coordinators do not make it mandatory, nor enforce the need for graduate school although personally it is beneficial for me to complete the GRE right now taking one more step towards graduate school. In many ways I am newly exposed to the world of academics and have found it beneficial so far to be a part of this REU for the summer with regards to opening and broadening my horizons whilst maintaining my joy for physics. I have learned much about professional relationships and what I can do to be an integral part in a symbiotic manner since I am working under the supervision of a principal investigator and graduate student. The College of Optical Sciences and CIAN’s program here at UA have been supportive with my decision to be involved in research and help bring opportunities to my attention in everything, from when they have left over boxes of pizza or internships that are within the scope of my major. On the business of graduate school it is interesting that rather than having to pay for a PhD program, fellowships, and other acquisitions of money are actually available. If we have all the qualifications needed to be a suitable candidate for grad school, which is what I’ve learned from professional educators: Michael Flynn and Don Asher, then grad school may be completely covered. In order to be a prime candidate for graduate school it is the general rule that we in many ways show academic prowess. 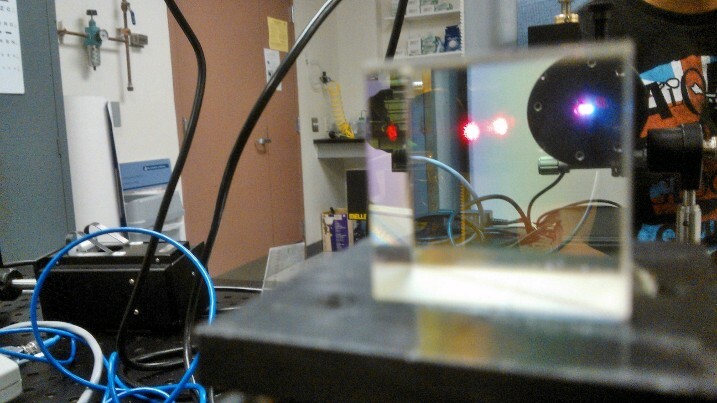 By investing my time here at the University of Arizona’s College of Optical Sciences I am able to learn the technical skills needed in graduate school to be a functioning researcher. It is not to say that I won’t fall, or fall hard, but like that of a German (Don Asher reference) I will get back up more times than I fall; I’d just rather persist is all. Working with persistent researchers and coordinators here has allowed me to see that the horizons are as broad as I wish to make them and that by taking the appropriate steps will allow me to eat steak and lobster in graduate school, though sometimes I’d prefer top ramen. 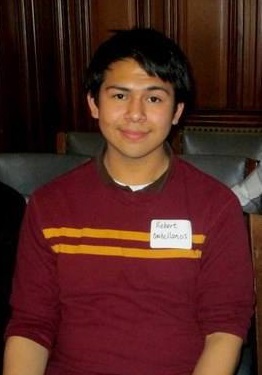 Robert Castellanos is to be a new transfer student pursuing a B.S. degree at Northern Arizona University in the fall of 2014. He is transferring from Haskell Indian Nations University, a tribal school in Lawrence, KS; there he earned his A.S. degree in Natural Science. He plans to study Physics and Astronomy in Flagstaff, AZ at NAU. Meanwhile, Robert is currently an intern for CIAN in the Integrated Optics for Undergraduates for Native Americans (IOU-NA) program at the University of Arizona where he is researching thin-film optics. Hobbies include video games and reading. Robert Castellanos is a member of the Colorado River Indian Tribes whose tribe is Mohave. This entry was posted in College Life, Education, Research and tagged CIAN Students, Native American, research, REU. Bookmark the permalink.